Welcome to our first Let’s Talk Art interview of 2019 and this time we’re joined by the incredible Billelis! Billelis is a freelance 3D Illustrator and Art Director residing in the UK. Many of you will know Billy’s 3D work; his style, concepts, and imagination always leave us in awe. We had to ask Billy about his work and hope this interview inspires you to create something. He talks about his inspirations, discusses his workflow, gives advice for upcoming 3D artists, and more. Firstly, thank you for being part of the Let´s Talk Art series. Your 3D work is incredibly recognizable. You describe it as “dark, yet elegant, romantic fusion”. What inspires you? Thank you for getting in touch :). I have always been inspired by classic sculptures, gothic artwork, human anatomy, and tattoo artwork. Since I can’t really draw on paper I found that working in 3D and a Wacom Cintiq helped me visualize what is in my head. 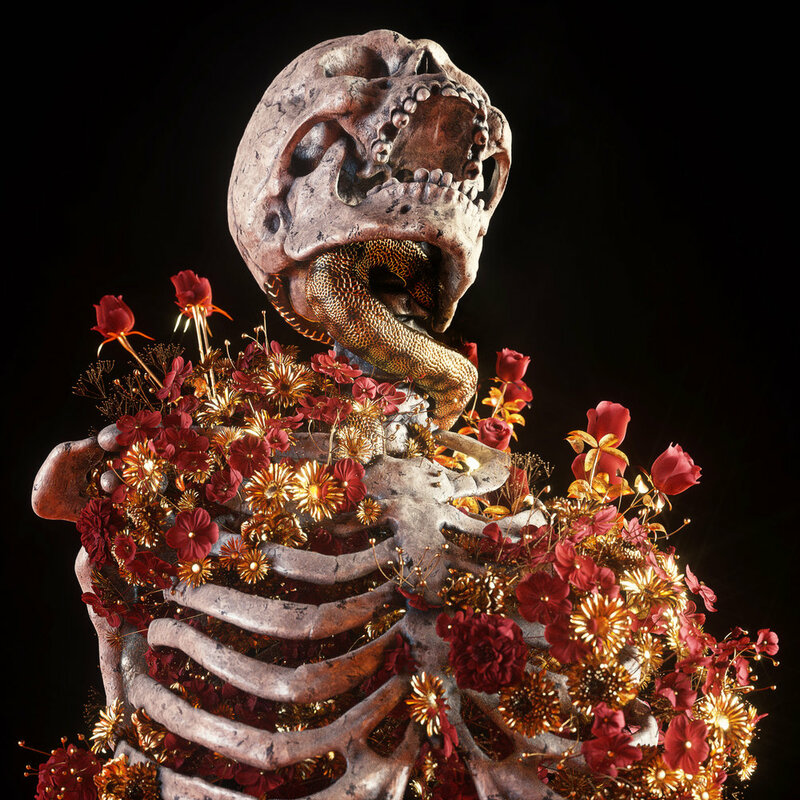 I feel like there is beauty in death and that has influenced my body of work. Another huge inspiration is a renaissance and baroque artwork and sculptures. The detail is simply mind-blowing and even though I could never get close to the skill and vision of the artists in those eras I try to use their influence In a digital manner. You’ve worked with many clients over the years like Nike, Netflix, Harper Collins. What was your favourite project you ever got to work on? There are so many favourite projects to choose from haha. But I think I love the work I did for Ozzy Osbourne and also some of the book covers I have done over the years as you get such creative freedom with cover designs and it is a great challenge to visualize what the author might have in their imagination. 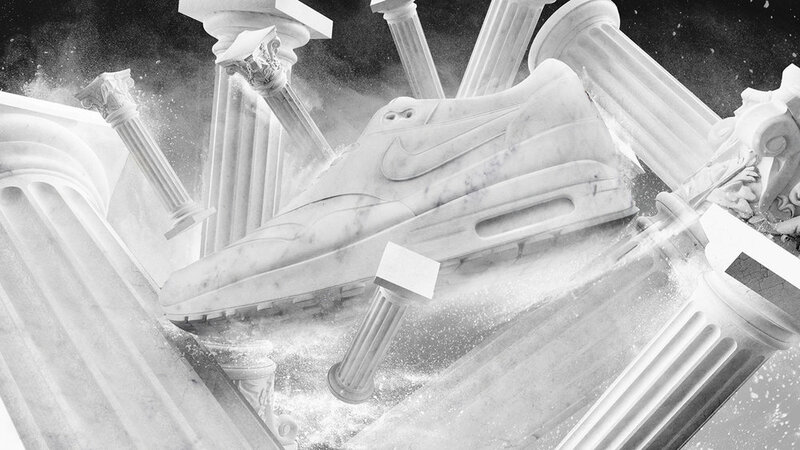 Another favourite of mine has been doing work for Nike. Even though you can be working on a project for 5 months and the end the executives cancel the project when the project actually gets published and you see the impact of your visuals in the advertising campaigns the feeling is amazing. Let’s not forget album covers though too as I have had the pleasure of working with some amazing bands and DJ’s that fully trust my vision and give me full creative freedom. Do you have a background in 3D design through school or are you mostly self-taught? I studied Digital Art and Technology but that was more based around generative and code art. So I would have to say I am mainly self-taught. With a background in motion graphics studios before setting up my own studio (Billelis). I do have to say however that I have been fortunate to have learned a lot but people like The French Mokey, Greyscale Gorilla, Beeple and the Octane Facebook Group alongside all the feedback in the Behance community. Even though your work often contains skulls, each one of your artworks differs from one another. Do you find coming up with unique ideas difficult? It is a pain for sure but also a challenge that keeps me going. Beeple does it and he is so inspiring so I think the concept of daily artwork is very important. Sometimes it becomes generic and overused but I feel if an artist has their own look and ideas then a daily challenge is a great practice in working fast and getting your ideas out there, I might post every day but some images can take a week to create. I think what I have found that really helps is creating series or concepts of work. Meaning that instead of creating a fully unique image a day, take some time and figure out a concept for a series of artworks. That way 3D wise the light and texture is there from the first image created then you can simply roll out the rest of the illustrations of the series with significant ease. This comes in handy with client work too when you have to propose a selection of concepts and roughs. What is your day to day workflow like? Do you work in a 9-5, and if you do how do you manage to find the time to create? I tend to work between 10- 6 at my own studio ( Studio Pic ) I used to work for agencies in the past in house but the last few years I focused solely on my own work and created my studio company Billelis Limited and frankly it has really paid off. It has allowed me to fully explore my personal work and invest the time to connect with clients I want to work with and not the work given to me by someone else. How long have you been creating in 3D and what software do you use? Around 10 years now. I mainly work in Cinema 4D for all my illustrations in terms of composition and overall scene building. I render with Octane Render because I love the speed and node-based texture system alongside the realism you can achieve, but I have used Vray, Arnold, and Corona in the past. Illustrator is used to create shapes and patterns before I make them 3D and sculpt to get flourish details. I grade and slightly retouch in Photoshop and use Lightroom for the final grade alongside Clarity effects and noise reduction. I also use Zbrush for sculpting and detailing scenes as it is an incredible tool. Can you walk us through the process of a typical piece, from conception to final render? Most of the time they are happy accidents. I constantly play around with techniques and texture setups then suddenly something clicks and I start to like the look of what I am making. Will then research decorative patterns, architecture, and sculptures and add all these influences to finalize the illustration. When I do have a set idea however I will always work in Clay form in order to get the composition correct before texturing and lighting. When it comes to texturing, I have build a material library of my own for easy access and I use HDRI Link by GSG and some HDRI packs from The French Monkey as they really help speed up the lighting and texturing workflow. Once rendered I add finishing touches in photoshop and Llightroom. What is your current studio set-up like and how does it help you to achieve the work you do? I have a Mac – PC network render hybrid kind of setup with a Wacom Cintiq and 2 x 27inch Dell monitors. Rendering wise I use 4 GTX 1080 Ti as I really need the rendering speed for Octane. The mouse on my desk is only for the render box. I simply can’t work with a mouse as the Cintiq feels so natural and intuitive. Hence why it is in the middle of my setup rather than on the side meaning I use it for everything from sculpting to retouching to sketching. I think my favourite use of the Wacom Cintiq has to be for Zbrush as it feels so natural working on the display. Also dodge and burn and soft brush grading in photoshop is incredibly intuitive because you can see what you are doing instantly. Although you create your work digitally, you often use a sketchbook to get down your ideas. How essential is this to your work? My sketches are very bad but it really helps to get a scribble down alongside some key notes before starting the process digitally. Time and time again I have forgotten about ideas I had written down and most the times simply flicking through my rough notes and sketches will spark a new illustration. So I find it very helpful to have ideas constantly being worked on. You are currently represented by the agency Nerd Productions. Many artists strive to get an agent to help secure them more work. Do you have any advice on how best to acquire one? Although I don’t think that an agent is essential it does really help, it depends on the kind of work an artist wants to do. My agent really helps when the big projects come that need vigorous time management, budget negotiation etc. They also handle a lot of pharmaceutical creative work that I do and they are great at advertising my work and doing PR within advertising agencies. I think for anyone trying to get an agent my tip would be to sign up to the AOI as they have a big list of agents and representation houses alongside loads of other helpful info. On your website, you divide your work from your personal art. How essential is this when it comes to artistic growth? And how often do you work on your personal portfolio? I feel that an artist’s own work is the best work they will ever do and the reason for that is their own passion and creativity goes in without any need for feedback from external sources. Don’t get me wrong feedback is always good for growth but I just love creating whatever the hell I want to create and pleasing my creative eye without having anyone else’s input. Since this is my full-time job and you constantly get feedback from clients it is very important to do something for yourself creatively. Do it for the fun of it. 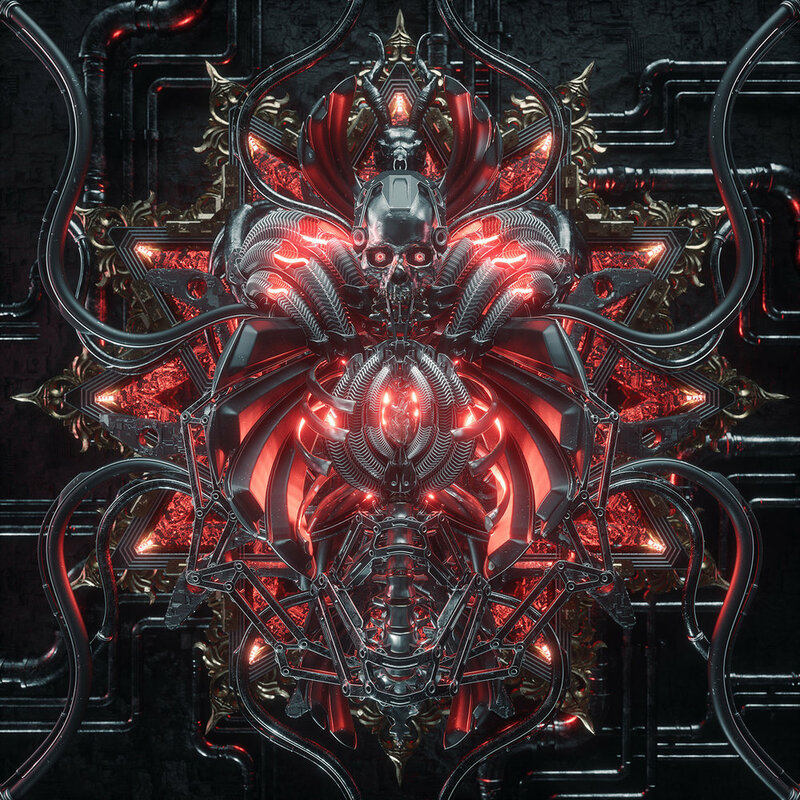 One project of yours, † Memento Mori III † features some wonderful textures and visuals, from splendid golds to mesmerising marble. What inspired this project and what was your process? I visited Prague last year and was blown away by the detailed artwork and sculpture work inside their cathedrals, bridges, and castles. Mix that with the Sedlec Ossuary which is a small chapel in the suburb of Kutna Hora just outside of Prague. The chapel interior is entirely decorated with skulls, skeletons, and bones. It features around 50.000 skeletal parts and skulls beautifully arranged to create chandeliers and crests depicting various stories. All these references alongside ancient Greek and Roman sculpture that really inspires me came together in this personal project that tries to mix all these elements in a series of 3D illustrations. 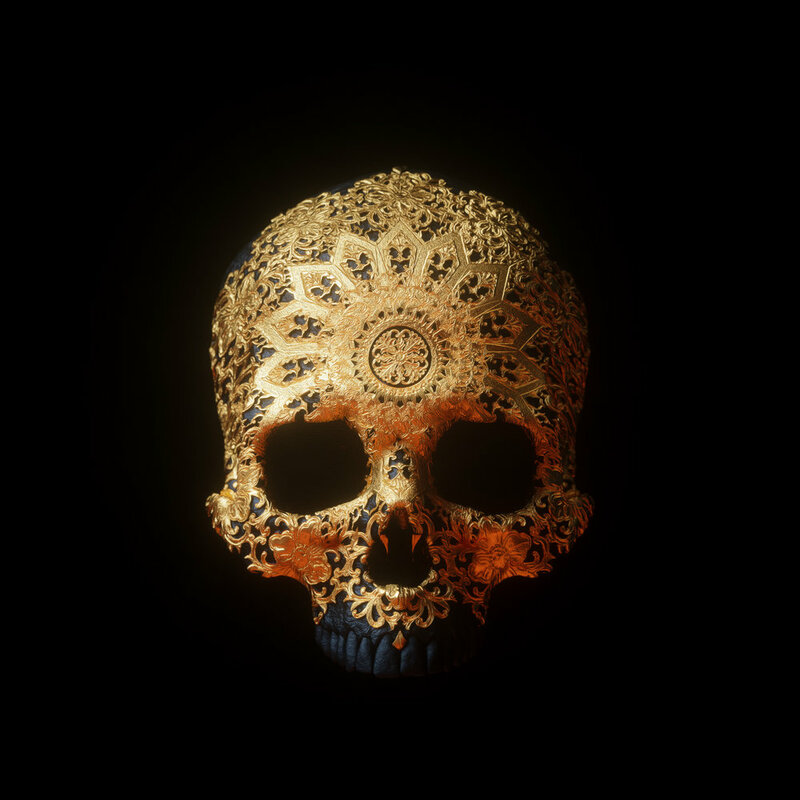 The mandala carved skull (pic) used a camera projection technique in 3D and texture displacement in order to raise the pattern which was a black and white version of an old illustration from the skull geometry. The headpiece artwork (pic) mainly used Mograph Cloner in C4D to clone and arrange the gold sun rays which are the main element in this illustration. The marble skeleton sculpture (pic) was made using photogrammetry 3D scan and a skull placed in the correct space of the head. Then used C4D volumes and fields to subtract the part of the face in which I wanted the skull to show through and did a final pass of damage and noise in Zbrush to complete the sculpt. I then used a series of Octane mix materials ranging from candle wax, porcelain, and rough white sand to create a marble texture. 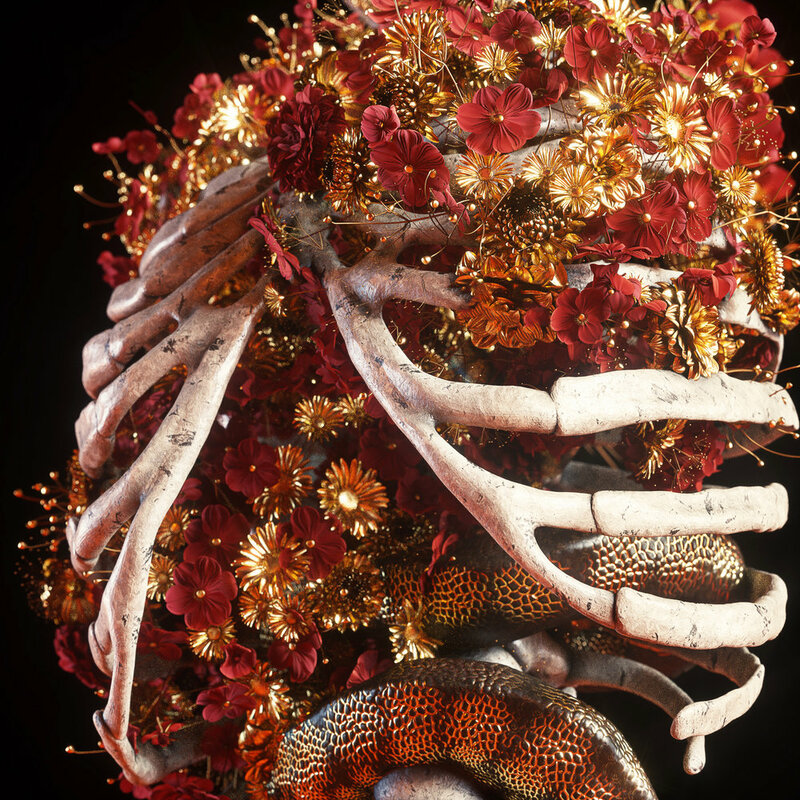 You project Blossom focuses on decay and growth, arguably a perfect way visualizeise death and the circle of life. What helped you to create these visuals? Did you draw inspiration from anything around you? I was very inspired by a quote from Edvard Munch:” From my rotting body, flowers shall grow and I am in them, and that is eternity. Alongside that, a murder scene from the Hanibal tv series wich featured a dead body with flowers growing out of the chest was a heavy influence and finally an episode in a murder mystery documentary in which specialists where brought in to examine a human skull that was overgrown with roots, flowers and mushrooms and how the floral growth could determine date of when the body was hidden in the forest. Dark yet fascinating. It’s quite remarkable how such a sad moment as a murder can give life to nature around it and how flora can grow on almost anything. Overall I just wanted to create a series of illustrations that were very dark in concept juxtaposed with elegant and bright floral growths. 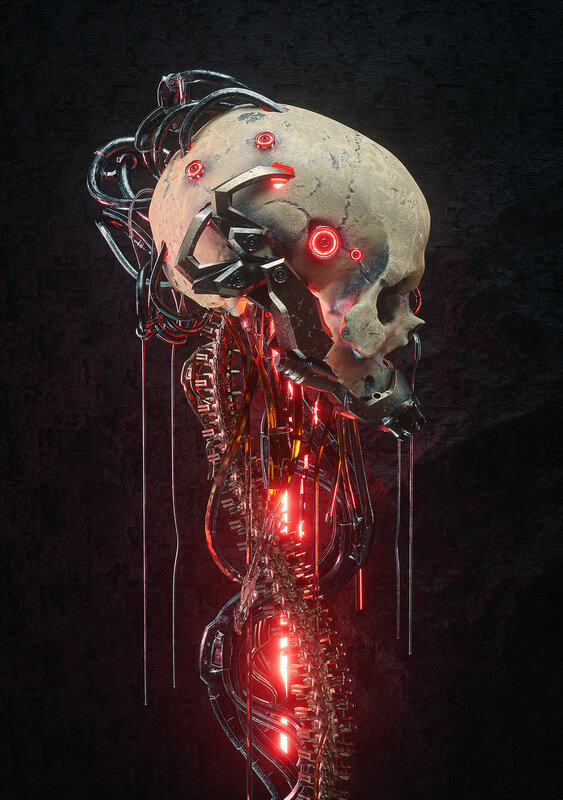 On Behance you broke down some process images, how do you render work like this? I personally start with a clay render to get the composition right. Then depending if I am working on stone/ceramic kind of materials I will use a spotlight kind of setup and a soft reflection HDRI. For metals, I almost never use lights but only use HDRI to get the correct reflections. After tweaking the overall look in the Octane live viewer it is time to send for final High Res render output at which point I tend to use ambient occlusion and normal passes in the multipass. That gives me a final layered PSD of a series of various passes which I use to grade the final illustration. AO especially is good for adding shadow at points and I love using the normal pass because I can choose a certain colour between RGB and then use that to add directional brightness in photoshop to increase the dramatic look. Once all that is done I use Camera Raw Filter in photoshop and tweak the highlights and shadows, add clarity and finally sharpen and denoise. Going forward, is there a dream project you’d love to work on? And how do you see yourself getting there? I would love to do key visuals for a film or a video game. Like cover art for packaging or the main promo artwork. Well, I am working on it but it just needs to be the right job at the right time. I am also working on building my illustrations in physical space using 3D printing. Watch this space. As your work progresses and improves, is there any particular piece that you created in the past that you’d like to revisit? I constantly revisit old work and try and improve on it. Whether it is new textures or merging it with something new I try to reuse older work but make it better. Sometimes though I am too critical of my own work and bin the file haha. It is always fun looking at old files though because it is a great reminder of how you have evolved your skills and style. With your personal work, do you ever set goals or aim for certain results with each piece? I want to reach realism with some of my work. It is very hard and I don’t feel I have reached the level of realism I want in my work but getting there. And I think overall I like to set myself challenges and also collaborate a lot with fellow artists as it is always interesting to see how other people work and how you can merge styles. Finally, many aspiring 3D artists follow your work hoping to learn more about your process, if you could give 3 top tips for 3D art creation what would they be? Don’t rely on tutorials for everything. Yes, they are helpful for various aspects but I honestly feel that through personal exploration and the use of forums I have learned the most. It is so easy to watch a tutorial and create something exactly the same as someone else but where is the fun in that? Work work work work and work a bit more on top of that. Remember that even though this may be your job is still one of the most fun jobs to have. Getting paid to create artwork is pretty awesome in my books.